Preheat oven to 375 degrees. Rinse off the pumpkin to remove any dirt. Remove the stem, seeds and stringy insides from the pumpkin. Use our roasted pumpkin seeds recipe to use as much of the pumpkin as possible! 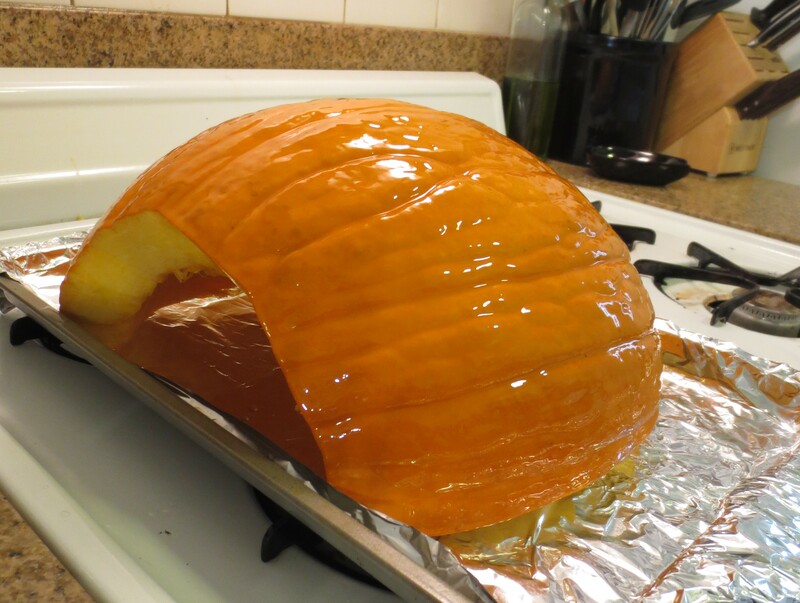 Cut the pumpkin in half and place cut side down on a foil lined rimmed baking sheet. Bake until fork tender (about 1 hour) then remove from oven and let cool. Spoon cooled pumpkin away from the skin and puree until smooth. (It should end up being about 4 cups). I used an immersion blender, but use whatever tool you have available. 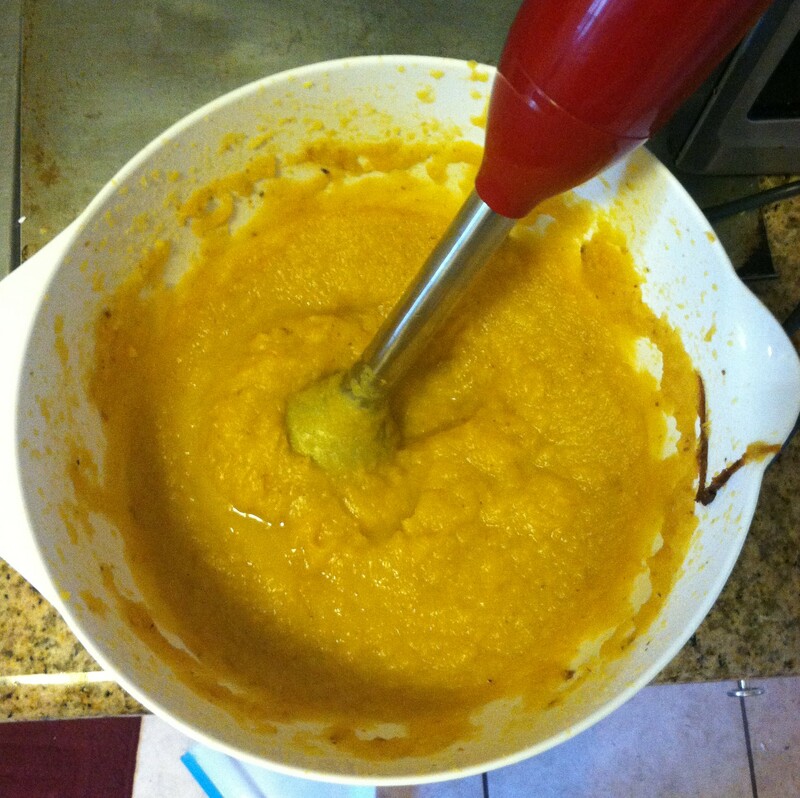 If needed strain watery pumpkin puree in a sieve or a cheese cloth. Mine certainly needed it so I used a sieve and strained it for about 20 minutes. Shift together flour, salt and cinnamon (or nutmeg). Cut the butter into the flour mixture until it has the consistency of cornmeal. Cut the shortening into the dough mixture until it is pea sized. Add the ice water and blend gently until the dough just holds together. Divide dough in half, shape each into a disk and wrap in plastic wrap. Refrigerate until ready to use if needed. There are two options once you have chilled your dough. You can roll it out, or press it into your pan. I chose to roll mine out, but I’m thinking next time I’ll press it. Pierce the dough all over and refrigerate for 15 minutes. Preheat the oven to 425 degrees. 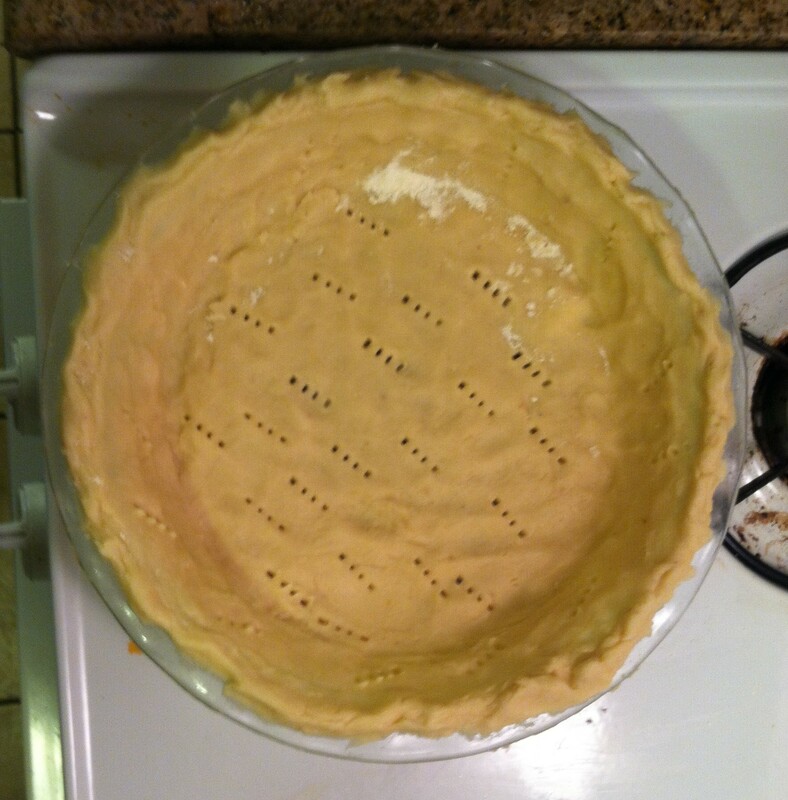 Line the crust with foil and fill with pie weights or dried beans (you can also use another pie pan of the same size). Bake until the sides are set, about 10 minutes. Remove the foil and weights and bake for another 5-10 minutes until golden. Preheat oven to 350 degrees. 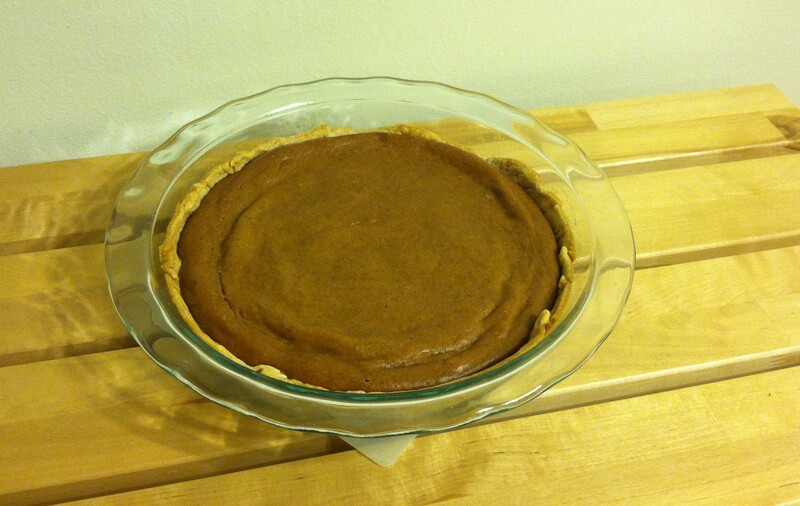 Combine all filling ingredients and fold into the pie crust. Bake until filling is set in the center, about 1 hour. 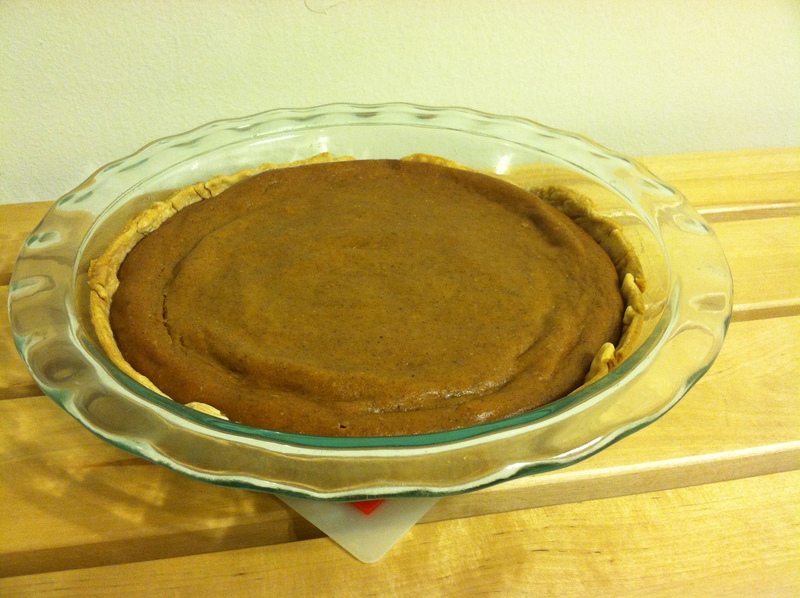 Remove from oven and cool for at least 20 minutes and serve at room temperature. Spoon cooled pumpkin away from the skin and puree until smooth. (It should end up being about 4 cups). 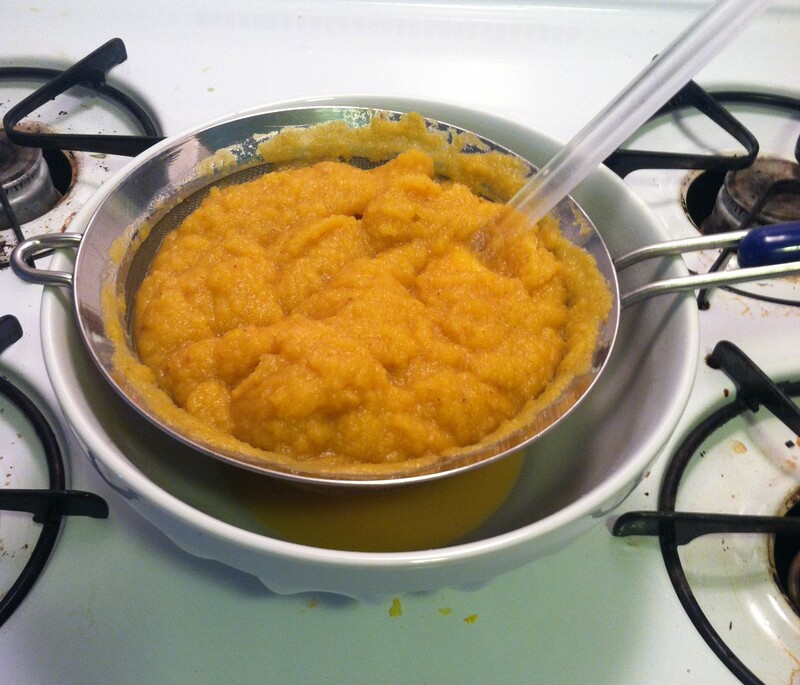 If needed strain watery pumpkin puree in a sieve or a cheese cloth. Cut the butter into the flour mixture until it has the consistency of cornmeal. Cut the shortening into the dough mixture until it is pea sized. Add the ice water and blend gently until the dough just holds together. Pierce the dough all over and regrigertate for 15 minutes. Remove the foil and weights and bake for another 5-10 minutes until golden. Bake until filling is set in the center, about 1 hour.